The infomercials for ExtenZe male enhancement pills have long been a source of laughs. This is true both for the original version of the ExtenZe infomercial with Ron Jeremy and the new ExtenZe infomercial with host Bridgetta Tomarchio and the sluts on the couch. But in those cases the humor comes from people laughing at the awkward attempts to convince men to buy pills to make their wangs bigger. Well it seems that the makers of ExtenZe have taken a new approach with their latest TV commercial. Instead of doing something that was unintentionally funny, they decided to create something that is intentionally funny. Perhaps they were inspired the by “Enzyte Bob” ads of their competitors. We then see them tie a rock to a man’s index finger. The effort turns out to be both futile and painful. 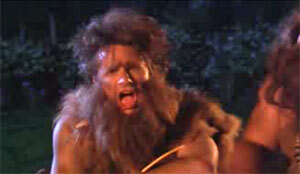 The cavewomen then laugh out loud at him—though it’s not clear if they are laughing at his failure, his pain, or just the fact that he has a small wiener in the first place. 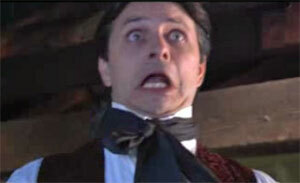 The next scene is set in the Victorian era. A scientist tries to use a metal ball and chain to lengthen a man’s member. The effort is once again as useless as it is painful. This results in the scientist thoughtfully stroking his fake beard. One question I have is how a man living in the prim and prudish Victorian era would even know the size of his manhood was inadequate? Most likely he frequented prostitutes who mocked his teeny weeny. That’s when he turned to an eminent scientist for some help. Of course when that didn’t work and the whores kept on laughing at him he did the only logical thing and became Jack the Ripper. We’re just supposed to imagine that the weight is really tied to their wangs. The people in these scenes believe in the theory that long fingers = long *****, and that long fingers are a cause and not an effect. We’ve been wrong all along in assuming we know what “that certain part of the male anatomy” mentioned in these ads really is. 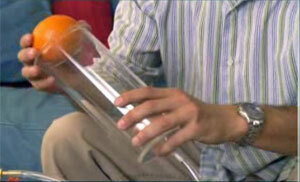 The final scene takes place in the present day and shows a skittish man putting an orange into a vacuum pump. Some hot blonde then hands the man a box of ExtenZe, which puts a goofy grin on his face. on the commerical on 29 on Extenze it,s time to qucki all of that. There are some people that don,t like to watch that or hear about that. Once you rid yourself of your prudish ways, you’ll find out how funny these commercials are. And I think the word your looking for is “quiT”, not quick.